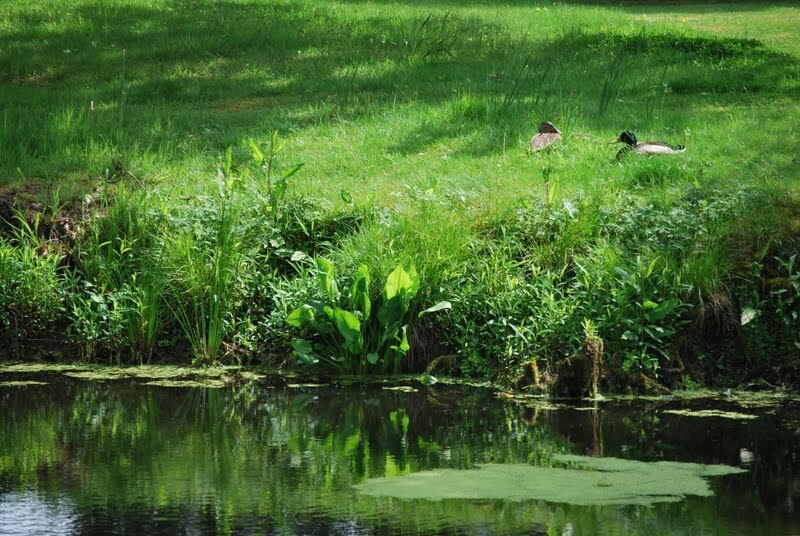 During the spring and summer of 2009, I was kept company at the Priory by a family of mallard ducks. I work alone (had I mentioned that?) so any company is very welcome. Whilst the drake quickly disappeared, the duck would lead her brood of 14 (!) ducklings across the lawns, from one pond to the other, several times a day. To begin with I thought that there were two ducks, each with fourteen ducklings, on each pond. Then, one day as I was weeding the Long Borders, I watched bemused as she waddled past with her kids in tow. Why she did it I’m not sure; it is a distance of fifty yards or more and the East Pond is much bigger than the West. It seemed a terribly dangerous enterprise to expose her young to potential danger (my dogs for example) when they seemed very safe out on the water. She managed to raise about eight of the ducklings to adulthood, and I remember how my walk about the gardens would, on occasion, cause an explosion of mallards to shoot up off the water. I was really pleased and looked forward to an annual duckling-fest. But it was not to be. I was puzzled and disappointed that the following Spring a small family of half a dozen ducklings disappeared without a trace. And then this year, despite seeing some adult mallards, there were no ducklings at all. 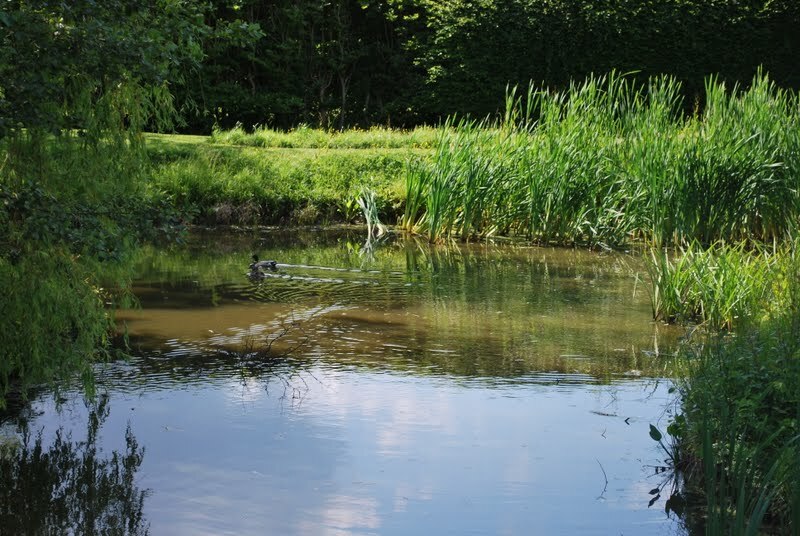 I had heard that moorhens (which do nest very successfully at the Priory) can and will kill ducklings but I also wondered whether it might be rats or a fox that was feasting on baby duck. 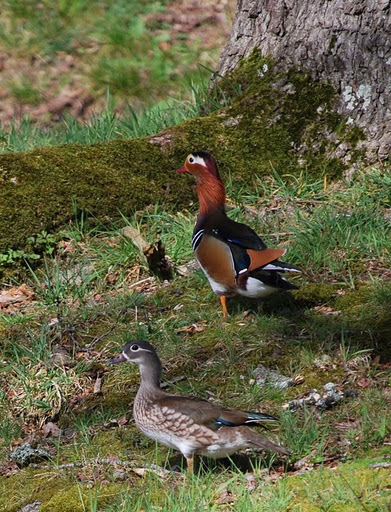 Back in April I wrote of how a pair of mandarin ducks had moved into my tawny owl nest box (see ‘New Residents at the Priory’). I was excited and looked forward to seeing some mandarin ducklings about the place. (Especially given the dearth of mallard ducklings). But again, there was a marked absence of baby mandarins; the whole family disappeared. What had happened to them? A couple of weeks ago Ben, a friend of mine from the village, was walking down the public footpath that borders the eastern edge of the Priory estate. At the end of the footpath is an old tumble-down brick bridge over the river. Ben had stopped to admire my leaf mould (who wouldn’t?) in the compost bins when he saw a glimpse of a swift moving animal over by the river. He rushed to the bridge and managed to take a quick photo with his phone of the swimming creature. 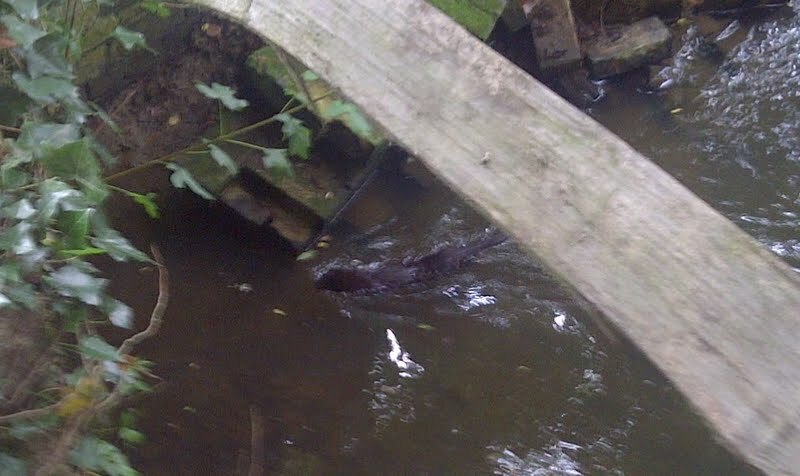 He texted me to say he thought he’d seen an otter at the Priory and emailed me the photo. I would be over the moon to have otter on the estate but sadly the photo is of something quite different. I think it is a mink. Bah. A North American native, mink have escaped from fur farms and are now well established in the UK. They are a voracious predator that feed on fish, birds and small mammals. Is it mink that devours mallard ducklings? And mandarin ducklings? 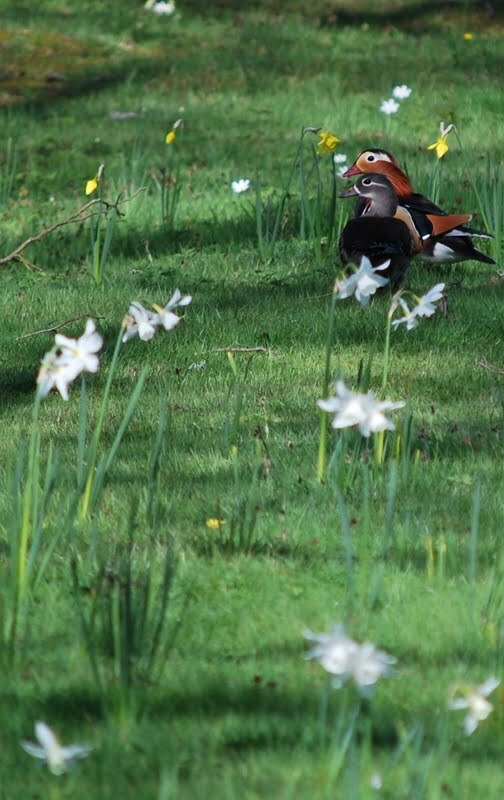 To be honest there could be any one of half a dozen reasons as to why there are no ducklings at the Priory including grey squirrels and magpies eating the eggs, stoats or weasels eating the young and even disease. But mink have got to be a prime suspect. Sigh. I would rather have an otter. Next time, we'll bring him along! Well, next time you're passing …. hehehe! Too bad we live so far. I'd bring him for a visit. He's the sweetest boy and neurologically impaired, but a gem when it comes to keeping pests under control in the garden. He was well-taught by our late cat. I hope next year brings wonderful sweet ducklings. We had a mallard pair visit us this spring (I posted about them on our blog). I'm sure they had a family and they have since moved on, but we enjoyed their visits to our yard (the dogs, not so much, but I give Spencer credit… he left them alone save for barking at them now and again). Wow. I wouldn't mess with Spencer! My dogs are a little too old to do much in the way of chasing let alone catching. And unfortunately it's not possible to have resident dogs at the Priory. I'll just hope that the natural ebb and flow of predators and prey will mean that next year I may get ducklings again. Here's hoping! (Luckily the Priory is rabbit free – so that's something). Our Spencer snagged 3 woodchucks (gophers) and 26 voles and chipmunks and rabbits two summers ago. Most of them avoid our property now – they communicate amongst themselves that it is not a hospitable place. One of the woodchucks was larger than he is – his sibling assisted him. I was totally freaked out, screaming for my step-son to help. It was a most memorable afternoon. We've had two wonderful summers of sweet baby birds and the gardens have now recovered from the damage the woodchucks and rabbits caused, which was very significant. Hi Cathy and Steve, I'm so pleased that the Priory is far enough away from any neighbouring houses that we don't get any cats. It used to really annoy me how neighbours' cats would come into my last garden and kill birds (and bats). Royal pets, huh? A pair of lions maybe? Would they deter mink? What a nightmare with those mink. We had a problem with them when I was growing up on a chicken farm. Some barn cats and a couple of dogs helped, but we still lost a fair number of chicks and eggs to the mink each month. People used to keep them for pets and then let them loose in the wild when they tired of them. My dad used to say, the only good mink is a coat. We lost a clutch of sparrows to a neighbor's cat last spring, and this spring, our little Cavalier King Charles Spaniels have been very protective of our two clutches of robins. They have shown no aggression toward the peeps but keep the rodent population to a minimum and keep the cats away as well. Maybe it's time for the priory to get some royal pets (if that would be allowed, of course!). Hi Bridget, to lose all your chickens must have been awful but twice …. Aaahhhh, Mink, I can't stand them. They killed all our chickens, twice. In the end we gave up keeping fowl. I really miss them though. Those Mandarin Ducks are lovely. Hi Sara, indeed. I think that if you're a duckling, so many creatures view you as a tasty snack. Poor dears. Blimey, yes Stacy. If I had otter at the Priory I'd spend my entire time watching them. (That and admiring my leaf mould). Mink don't have any predators in the UK and yes even a couple of years ago a fur farm was raided and the mink released. Ardently anti fur farm as I am, that is just plain stupid behaviour, imho. It would have been nice to have some ducklings around Jason. I don't want tame ducks mind. I've worked in gardens before with ducks and geese and they make an awful mess. Having wild ducks about the place is much nicer. Occasionally I get wild geese on the ponds though they are far more shy and leave as soon as they see me. Quite fancy a swan or two! Hi Dave, shame about the lack of ducklings; it would have been especially nice to see little mandarins waddling about the place. I think perhaps you need lots of Springwatch style cameras about the place and then you might be able to uncover the mystery, or the culprit! I don't blame you for preferring the otter–with that and good leaf mould (and maybe some ducklings), I'd think your life would be pretty well complete. (But now it sounds like you'll have to settle for leaf mould.) Do mink have any natural predators at all in the UK? I've read that a lot of the mink have been released from fur farms by guerilla animal rights activists–a case where the cure seems to be worse than the disease. Hi Helen, somebody else suggested that pike might be the culprit. The East Pond is about five foot deep even at this time of year with the water level being relatively low. So though I've never seen pike at the Priory – I suppose that there might be some in there. I doubt it though – there is no way into the ponds from the river. No, I don't think you can be rid of mink. It is one of those non-native invaders that does economic and environmental damage that we must just live with. (Though I read fairly recently of a chap in Northumberland who had pretty much rid parts of that county of Grey Squirrel). I was going to suggest pike until I got to the last bit of your post. Can you get rid of the mink?